ANGELL GALLERY is pleased to present STEVE DRISCOLL: INTO THE WIND, a solo exhibition of recent works by this acclaimed painter. The exhibition is on throughout the gallery from January 9 to February 8, 2014. An opening reception will be held on January 9, 6:00 to 9:00 PM. Steve Driscoll, one of Canada’s most innovative contemporary landscape painters, has a unique signature technique that he was been developing for over a decade. 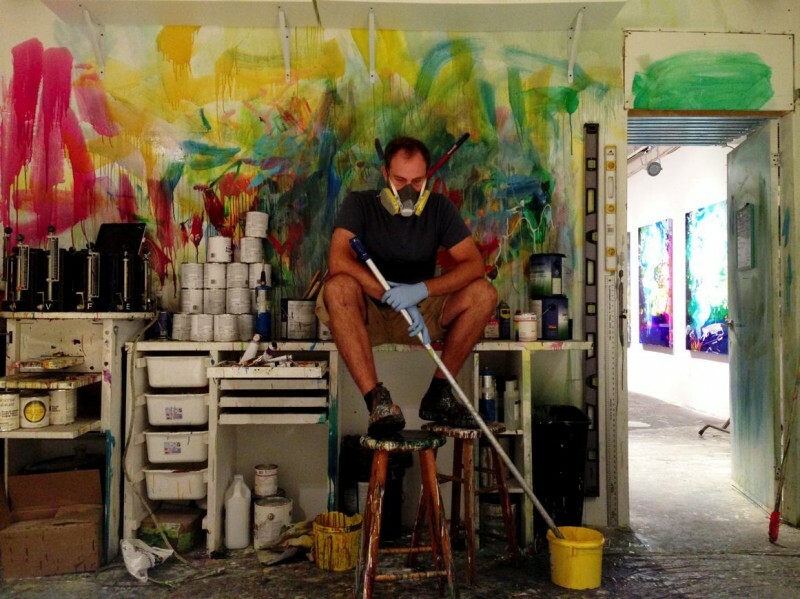 Using urethane as his medium (a challenging material that requires special ventilation and years of practice to master), Driscoll layers his surfaces with transparent and opaque colours, using a combination of pouring and brushwork techniques. China markers bring graphic and representational elements to this painterly mix. Driscoll’s ever questing nature is always producing new processes and approaches to materials. The sophisticated colour sensibility apparent in these works is the product of the artist’s recent practice of using studies to fine-tune choices. One work features carving, a technique Driscoll used in the past, here revisited to exciting effect. The artist’s passion for the great outdoors is reflected not just in his subject matter, but also in his materials — namely supports made from synthetics used in state-of-the-art canoes. These lightweight surfaces both facilitate the creation of large scale works, and offer intriguing textures that Driscoll incorporates into his imagery. An iridescent pattern in a carbon-fibre support becomes the twinkling of a night sky. A surface resembling burlap suggests canvas, a nod to the paint-on-canvas landscapes of the Group of Seven, who one century ago were Canada’s vanguard. As heir to that tradition, Driscoll’s tribute is apt. Steve Driscoll is an award-winning Toronto-based painter who has had nineteen solo exhibitions and has been in group shows throughout North America. He has executed numerous commissions and has been featured in Canadian Art, dART International, The Telegram (NL), NOW Magazine, CBC TV and ArtSync TV. Publications include the 2012 monograph intelligence with the earth, with text by Gary Michael Dault.